What Is The Endocannabinoid System And Why Is It Fundamental To Human Health? The endocannabinoid system is a relatively recent discovery, yet it is one of the oldest biological systems on earth. For millions of years, a natural system has discreetly performed thousands of vital functions – for bodies that, until recently, have been completely unaware of its existence. So what exactly are we talking about here, and how has it escaped our notice for all this time? Well – it’s relatively easy for surgeons, morticians and so on to cut up a body and identify large, obvious things like a liver or a pair of lungs. But in this case, we’re talking about something much harder to see and identify – a group of interrelated molecules, which work together on a microscopic level to keep those large, obvious things like the liver and the lungs working correctly! That, necessarily, is what the endocannabinoid system is. It’s a set of proteins and fatty acid-based molecules that work together to control and regulate a vast range of metabolic functions. 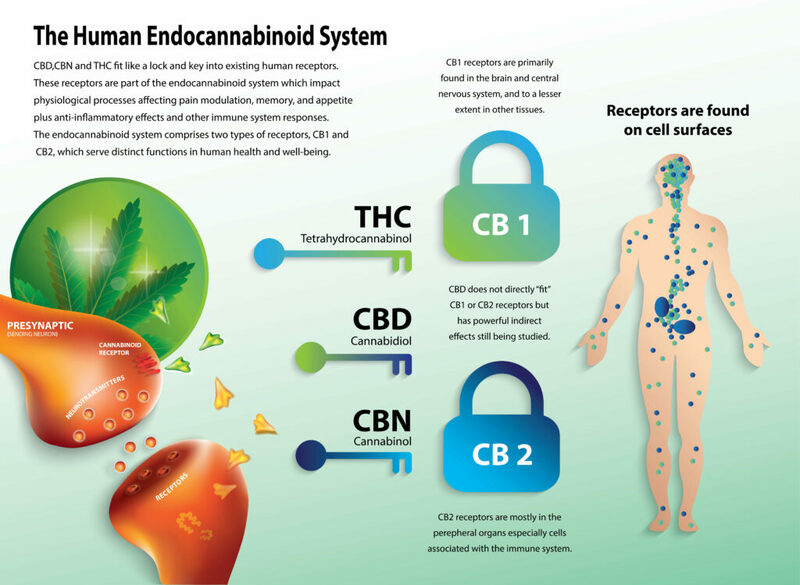 So How Does The Endocannabinoid System Work? We still have a vast amount to learn about the endocannabinoid system. However, almost three decades of research has given us a lot of information about the endocannabinoid system – so let’s start with what we do know. The endocannabinoids system depends on a set of proteins known as cannabinoid receptors. We are aware of the existence of 2 main types of cannabinoid receptor – the CB1 and the CB2 receptors. As well as receptors, the system also depends on another class of compounds that can “bind” to the receptors and transmit information. These compounds are typically known as “endocannabinoids,” and include the famous anandamide, which is almost like the body’s home-grown answer to THC. The cannabinoid receptors are found inside the membranes of cells throughout the body. The CB1 receptors are typically found in the brain and the central nervous system, where they help regulate essential processes like appetite, sleep, pleasure & reward, sense of smell, and fine motor control. The CB2 receptors are distributed throughout the immune system, peripheral nervous system (the small nerves that control pain at the level of the skin and just below), gastrointestinal tract, and also in the brain (but in much lower concentrations than the CB1 receptors). The CB2 receptors regulate a wide range of immune functions, including the behavior of white blood cells, and are also thought to provide significant neuroprotection against the development of disease such as Alzheimer’s. The endocannabinoids bind to the receptors and transmit information that helps the body to fulfill essential processes. The principal endocannabinoid found in the body is known as anandamide, from the Sanskrit word ananda meaning “joy” or “bliss.” Anandamide is structurally similar to THC and has many similar effects, so it’s often thought of as the body’s answer to THC. Anandamide binds to both the CB1 and the CB2 receptor. By binding to the CB1 receptor, anandamide helps to regulate functions such as memory, sleep, appetite, and pain management. By binding to the CB2 receptors, anandamide may also contribute to control pain, and is even thought to be instrumental in fulfilling various immune system functions. As well as anandamide, the body also naturally produces the endocannabinoid 2-Arachidonoylglycerol, which is commonly known as 2-AG. 2-AG is a very important compound that is found in high levels in brain tissue and in the central nervous system, as well as in human breast milk. 2-AG is also thought to play a fundamental role in regulating various bodily processes including sleep, appetite, pain and immune function. Why Is The Endocannabinoid System Fundamental To Human Health? As we learn more about these vastly complex bodies we occupy, we are discovering that these finely-tuned systems, involving groups of molecules that all have specific roles and abilities, are fundamental to maintaining optimum health. If the endocannabinoid system is out of sync, it may lead to a range of diseases and syndromes – and if patients suffering from such syndromes receive targeted treatment to repair the natural levels of endocannabinoids and receptors, they tend to improve. We even have a name for this syndrome – clinical endocannabinoid deficiency – and it is thought that this underlying problem could be the cause of various diseases including chronic migraine, fibromyalgia, irritable bowel syndrome, and different other conditions.